in garter st with yarn held double on larger needles. 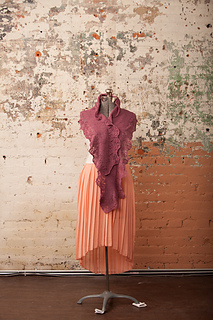 Imogene is an elongated triangular scarf with a garter body that is surrounded by a deep lace border. -Finished Size: 62” long and 13” deep at center. 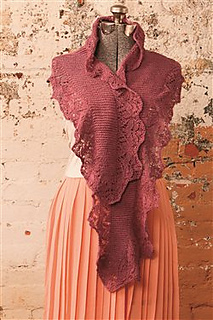 -Yarn: Lantern Moon Scrumptious Lace (55% merino wool, 45% silk; 1093 yd 994 m/3 1/2 oz 100 g): #509 rose pink, 1 skein. -Needles: Size 5 (3.75 mm): straights. Size 4 (3.5 mm): 32” circular (cir). Adjust needle size if necessary to obtain the correct gauge. -Gauge: 22 sts and 30 rows = 4” in garter st with yarn held double on larger needles. 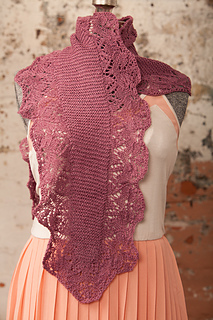 - I am using a alternate yarn…what is the yardage? The sample was knit with 70 grams/770 yards (700 meters). To decrease the yardage needed, shorten the body section slightly (1-2”/2-5 cm), but maintain the lace border stitches.